DENVER -- Family members say the father of a 2-year-old girl killed in a crash on I-70 Friday afternoon is struggling to come to terms with his loss. 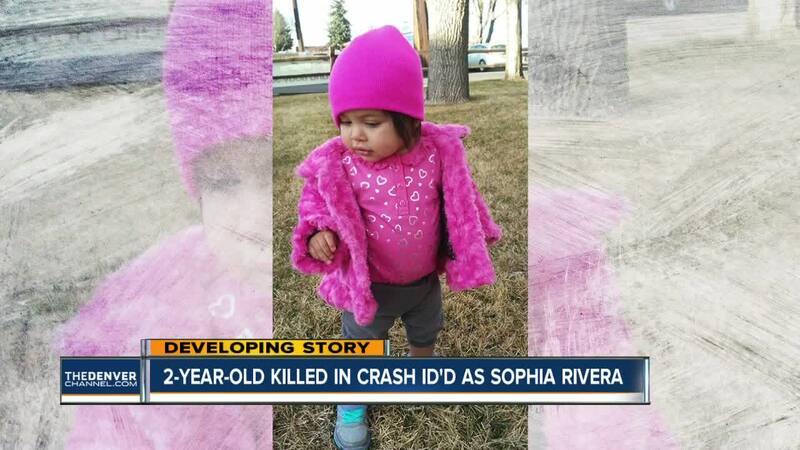 Sophia Rivera was in the back seat of her mom's car when the crash happened. "She was going to drop Sophia off at her father's house and never made it," said Corenia Rivera, a paternal aunt. Investigators at the Colorado State Patrol say the mother was eastbound on I-70 when she suddenly slammed on her brakes, lost control of her car, careened through the median and into the westbound lanes, and then struck a pickup truck. The impact of the collision demolished the back half of the mother's car , which is where the toddler's car seat was located. Corenia Rivera said Mark Rivera never got to see his daughter one last time. "He still hasn't been able to see her yet," she said. "He has to get a Coroner's release." Corenia told Denver7 that Mark suddenly has to make decisions he never thought he'd have to. "He's like, 'do I cremate her, do I bury her? What do I do?'" she said. "That's where I came in and told him, 'it's up to you. She's your child.'" Corenia has set up a GoFundMe account to help the young dad with funeral expenses. She said she's offered words of encouragement to her brother-in-law, telling him that Sophia is now in heaven, with her grandmother. "I know this happens every day," she said. "It happens to somebody's child, somebody's niece or somebody's sister... but when the tragedy happens to you, it's a different story." When asked about Sophia's mom, Corenia said, "She doesn't have a clue about this because she's still in ICU." The Colorado State Patrol says it is recommending that charges of Vehicular Homicide be filed against the mom. CSP has not released her identity. A spokesman for CSP said alcohol is believed to have been a factor in the crash.